Carey MacDonald is an undergraduate Anthropology major and writing intern. 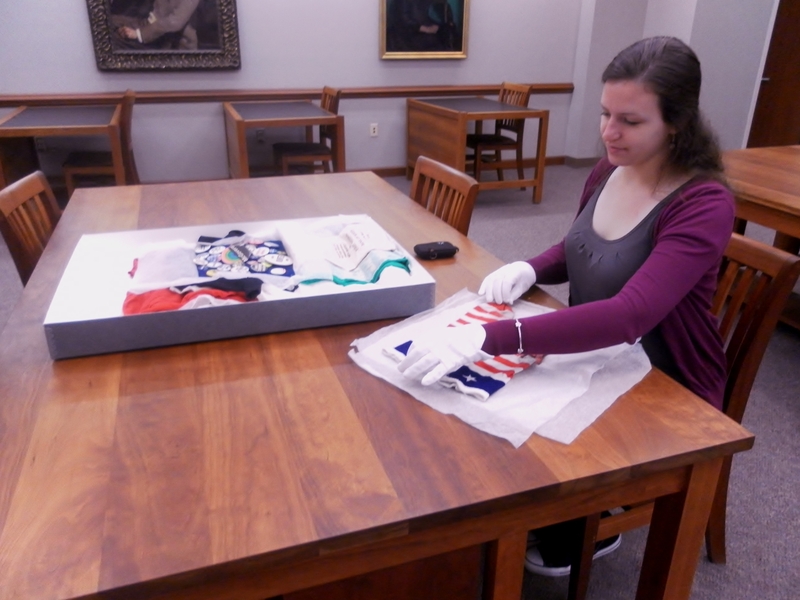 In her new series Through the Lens of an Anthropologist, Carey analyzes artifacts found in the collections of Archives and Special Collections. Sociocultural traditions pervade the human experience and provide a reliable mechanism for social cohesion. It is commonly thought, though, that traditions are strictly old manifestations of an earlier cultural context, when, in actuality, they evolve and create a distinct reality for each successive generation. Yet traditions only evolve and persist for as long as their adherents maintain, reproduce, and reinforce them in their culture. Such is the case of the college freshman beanie, a colored cap that freshmen were required to wear as a form of initiation into the greater university social setting. According to the University Archivist Betsy Pittman, the tradition of wearing this cap was ubiquitous among American universities during the late nineteenth and twentieth centuries. 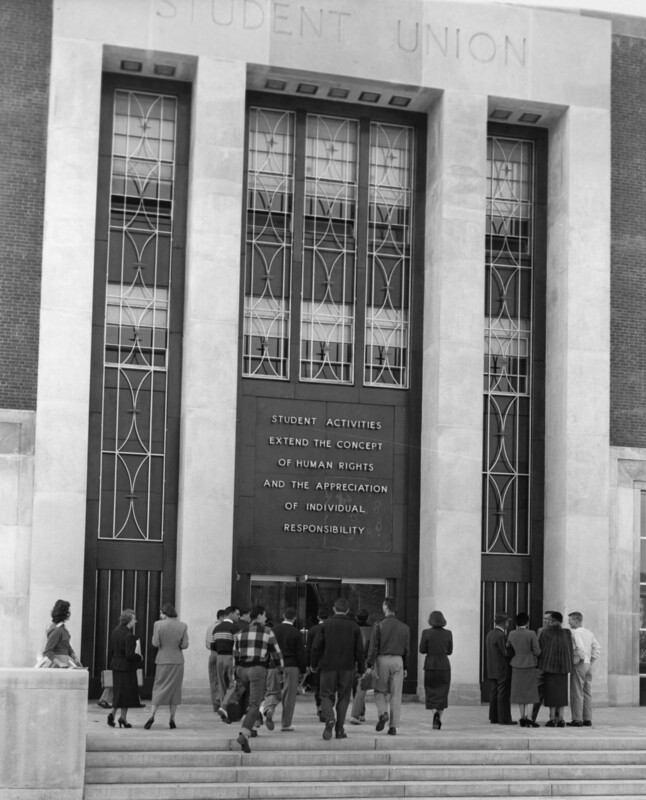 For younger generations though, this tradition no longer exists in the form that it once did, although there certainly exist other freshman initiation rites, particularly within the scope of Greek life, honor societies, and sports teams. An example of the UConn freshman beanie tradition comes from the University Memorabilia Collection. The crown of this beanie resembles a circus tent: it is patterned by six alternating blocks of navy blue and white (university colors) and is held together in the center by a white fabric-covered fastener. An insignia of ‘5 C 7’ is embroidered on the front of the cap above the narrow, white brim. ‘5’ and ‘7’ are placed on either side of ‘C’ in a thin, navy blue felt font and represent that freshman class’s graduating year – in this case, the class of 1957. 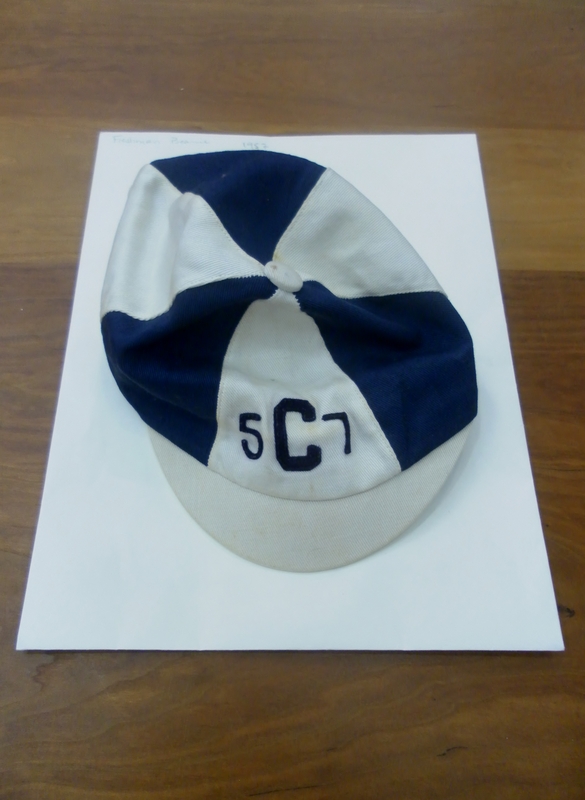 ‘C’ is sewn in a larger, thicker, navy blue felt font and most likely represents Connecticut. Also important is the name Eugene H. Starger, which is handwritten in what appears to be thin permanent marker or black pen on the inside rim of the hat. It seems that Eugene got a lot of use out of his beanie since it is stained; it is apparent that he wore this beanie more than once, as it was a necessary part of his attire for at least some time. As your infantile brain could not possibly assimilate the significance of a proper beginning, tradition places the burden of guiding you through this, your first year at C.A.C. on the broad, capable shoulders of the Class of 1924…Transgress sacred College Tradition and never…will the haunting memory cease to picture that terrible night when you so unexpectedly disturbed the Waters of Swan Lake. This message is clearly intended to ensure that no freshman would ever “transgress sacred College Tradition,” capital letters and all, because if they did, they’d be punished and thrown into the lake. The handbook continues by giving freshmen explicit instructions for using the beanie. They were to wear this distinct cap and conform to the rules. 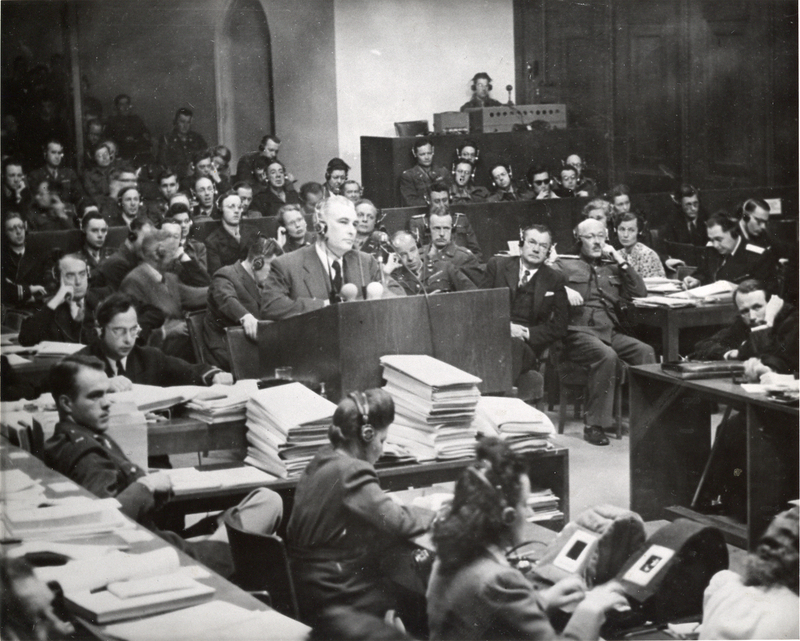 Sophomores were to distribute the caps and enforce the rules. Thirty-two years later, the student-written Husky Handbook of 1953-54 – the same year that Eugene H. Starger was a freshman – requires freshmen to wear their purchased beanie until the ‘season’ is over. The season ended if the freshmen won the Frosh-Sophomore Rope Pull contest across Mirror Lake during the first month of school, but if the sophomores won, then the freshmen would have to wear their beanies until Thanksgiving break. Jonathan the Husky has been the mascot of the University of Connecticut since 1935, four years before Connecticut State College became the University of Connecticut. The first Jonathan, a black, brown, and white animal, was short-lived, hit by an automobile only weeks after his arrival on the Storrs campus. 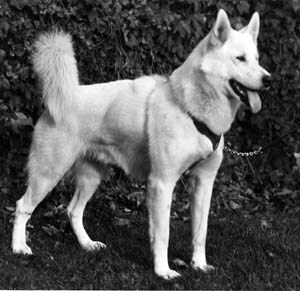 His successor, and the one that started the tradition of an all-white Husky mascot, made his much anticipated debut on November 8, 1935. His would be a long career, serving until his passing in 1947. In 1936 he chased Brown’s bear mascot up a tree, requiring Providence police and fire fighters to get the bear down. COSTEP-CT, a group based in Connecticut that encourages disaster preparedness and recovery in the state by individuals as well as organizations, has developed some basic guidelines for recovery efforts for storm damaged family heirlooms and antiques. The guidelines describe basic activities for cleaning and drying water-damaged materials including paper based items, framed artwork, photographs, textiles, leather, bone/ivory, metal and sound and video recordings. COSTEP-CT also provides contact information for materials requiring more than basic care. Clothing, as a fundamental, human form of expression, is symbolic of our cultural, social, and physical environments, as well as of our experiences and beliefs. T-shirts, jerseys, hats, pins – these things are worn as distinct symbols of an individual. But what about a pair of socks? Abbott “Abbie” Hoffman, the Massachusetts-born activist and co-founder of the Youth International Party, or the Yippies, of the 1960s and ‘70s, is best known for his unabashed and public criticism of American government policies and politicians. He used calculated political theater to engage young people in the political and social issues of the time and to organize them in the effort to reform the government and the nation. Hoffman’s revolutionary ideology manifested itself in his own self-expression; he publicized his ideas by way of media coverage of his demonstrations, as well as through the very clothes he wore on his body. In the collection of the Hoffman Family Papers we see that Jack Hoffman, Abbie’s younger brother, maintained regular correspondence with Abbie throughout his years of activism. 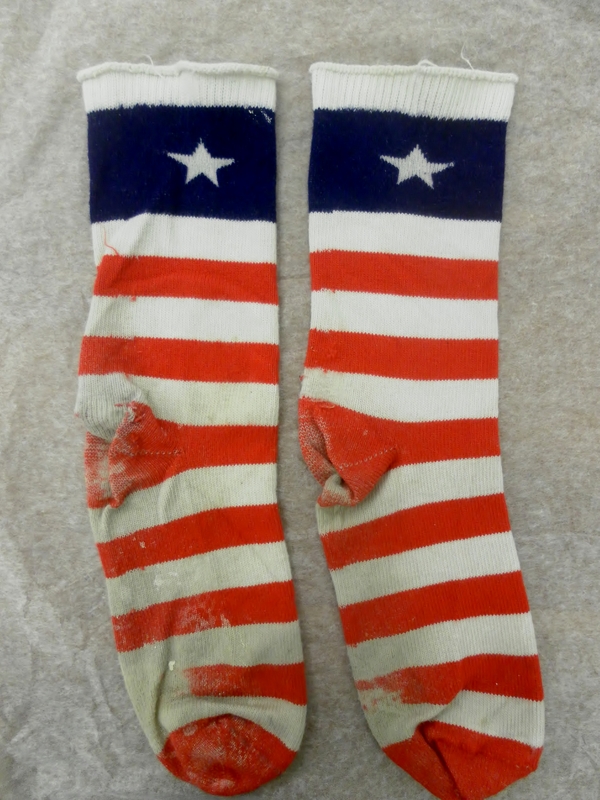 Jack later gained many of Abbie’s possessions, such as the aforementioned t-shirts, political pins, and, naturally, a dirty, well-worn pair of red, white, and blue socks that resemble the American flag. The socks’ knitting is worn away in the toes, heels, and calves, indicating their habitual use. Since he frequently wore them and kept them long enough for them to eventually reach his brother, these red, white, and blue socks must have meant something to Abbie. And they certainly mean something to us today about his life and his activism. At the 1968 Democratic National Convention in Chicago, Abbie and eight other leaders and their Yippie followers held a demonstration against the war in Vietnam and pushed for social and political reform in Washington. In an amateur video taken of Abbie discussing the forthcoming demonstration in Chicago, he articulates his plan to take social action at the Convention for the exact purpose that there would be extensive media coverage of the goings-on. He expected that every hour or so during the televised Convention the cameras would cut from the politicians’ speeches to the Yippies’ demonstration, and the viewers would immediately be interested in what they were doing. In preparation for the demonstration, the mayor appeared on television constantly and stationed police forces and Secret Service agents in the city. In interviews with journalists prior to the event, Abbie likened the whole scene to an exciting football game, like the Rose Bowl. By implementing dramatic, theatrical tactics to capture the public’s attention, Abbie and his Yippie friends could deliver their message in the spotlight. However, to the Mayor and politicians, the demonstration at the DNC was viewed as a violation of the Anti-Riot Act that had been established in April 1968 after the assassination of Martin Luther King, Jr. Similarly, the American flag t-shirt that Abbie wore during the ensuing trial of the demonstration leaders, who were known as the Chicago Seven, was perceived by the judge as a desecration of the flag, a national symbol that is meant to be revered. By practicing these forms of political theater, Abbie Hoffman managed to create “an advertisement for revolution,” as he calls it in his 1968 book, Revolution for the Hell of It. As for his red, white, and blue socks, it is very possible that he wore them to be viewed as a defilement of the flag. Or, after he was acquitted of conspiracy in 1973, he may have worn them during the years that he was on the run after jumping bail for his arrest for cocaine possession. Yet it is also conceivable that he wore them to promote his image of a new, reformed America. He could have been expressing his patriotism and hope to his fellow Yippies and Americans, and since he personally knew he was wearing them, they could have symbolized, for himself, his idealism and belief in social change.